That’s probably your first thought after every episode of “American Horror Story,” but last night’s installment of Season 8 aka “Apocalypse” took that eternal question up to 11. So TheWrap caught up with “AHS: Apocalypse” executive producer and writer Tim Minear on Thursday to ask him what the heck he and co-creators Ryan Murphy and Brad Falchuk are doing to our brains right now. TheWrap: OK, first of all, it’s been two episodes now — when is the crossover stuff coming? Minear: I would say that it’s going to happen before you know it, and when it happens it will snap your head around your neck. Alright, cause we’re getting impatient and pretty confused right now. So far we’ve seen Michael Langdon and Rubber Man, but those are our only callbacks to “Murder House,” and no one from “Coven” has appeared — but based on next week’s preview the witches are coming. Are we going to see some more familiar faces soon, in addition to the new “Apocalypse” characters? So Rubber Man, was he a vision or a real person? Well, look, if you go back to “Murder House,” I think you were probably asking the same questions about Rubber Man. Sometimes he seemed ethereal, sometimes he seemed corporeal, and sometimes he was kind of a combination of both. And I think that all of that applies. On “American Horror Story” it’s often a kind of dream logic — but there is a logic to it — but it’s a dream logic. So, yeah, we’re in an apocalypse, but if that place isn’t haunted, I don’t know what is. Fair. 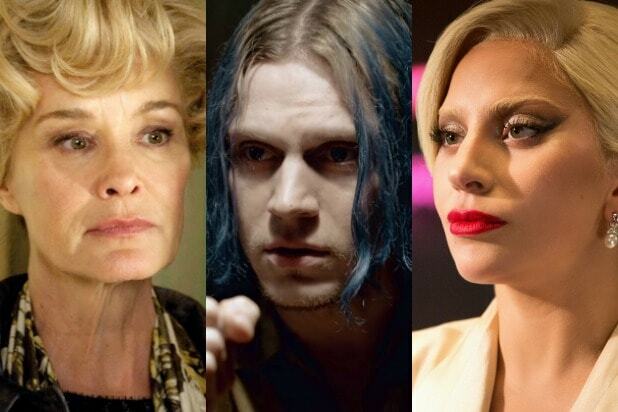 Based on teasers it looks like next week is the staple of every “AHS” season — the Halloween episode. And in “Murder House” we learned ghosts move freely on Halloween? So the “Murder House” ghosts could theoretically come visit Outpost 3, right?